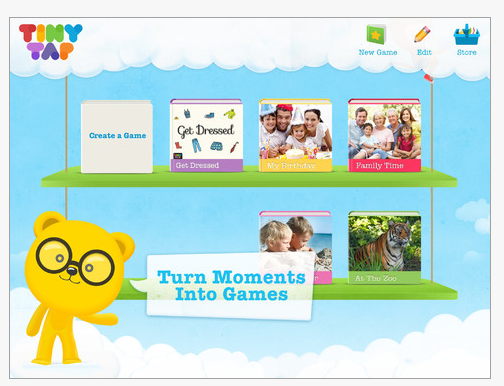 Tiny Tap is a free iPad app that makes creating content and “games” an easy task. Not only is it very easy to use, but offers a method of creating a quiz with basic data collection on user responses. Geared to users who perform best with audio and image support (no text option is currently available) and physically interact with the touch screen, Tiny Tap allows you to create a “game” or questions about a theme or any variety of pictures from your photo album or camera. Steps to creating in Tiny Tap involve choosing an image or pictures of objects or vocabulary that response to questions of “show me”, “where is the ___ ? (object)”, that the user can relate to. 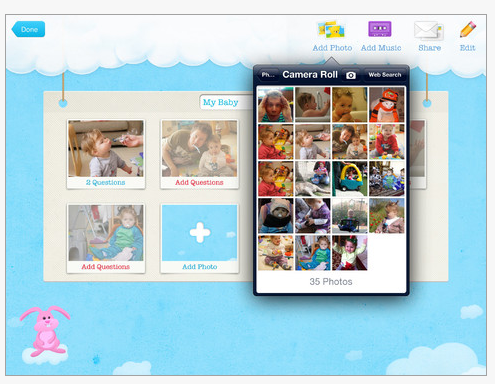 As shown below, images can be easily added from the camera or from your iPads Photo Album. 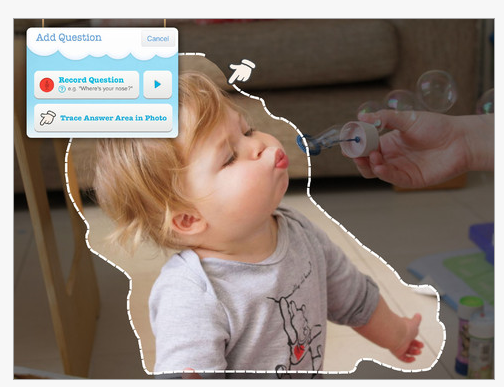 The next step involves recording a question such as “where is” or “touch the”, then select/trace the object in the picture that is the answer to your question. Very fast, simple and easily edited. After recording your initial question, you have the option of recording a correct response or incorrect response. Responses to correct and incorrect answers can be recorded. Options of types of music chosen with the app and turning the music on and off can be added in the game. Visual and audio feedback is provided to the user after selection of the answers along with data collection supplied at the end of the game. Game creations can be shared via Email, Facebook or iTunes. Tiny Tap is an easy method of creating a game or quiz for individuals with emergent learning skills and can provide teachers, parents, students or therapists an easy tool for creating “games”. Editing is also easy for creators to perform during production or at a later time. For users it provides a simple, interactive game for answering questions or a study method for some students. In store app purchases provide some free downloadable “games” such as a Color Game, Dress for Winter and pay for “games” such as Farm Animals, Making Pizza or Music. Check out Dress for Winter free game for a great example of what you could do for basic identification of clothing by seasons. It is a spring-board for ideas of creating functional life skills, vocabulary, sensory or social skills “games” for your child, student or client. One option I would like to see in this app is the ability to add text to support emergent literacy or students who benefit from presentation of information visually whether image and or text. Another free app for your OT, Teacher or Therapist iTool Kit! This entry was posted in App Reviews, Apps for OT's, Apps for Special Needs, Early Childhood, Elementary School, iPad, Occupational Therapy, Primary Grades, Special education, Special Education Teacher, Special Needs and tagged App Review, iPad, occupational therapy, OT Apps, special education, special needs students. Bookmark the permalink. Great list of free apps for elementary skilled students.